Shropshire businesses are being warned to allow extra time to file documents with Companies House in the coming weeks. Amanda Wickstead, from our Corporate Department, said the long-awaited final details of the Companies Act were due to come into force at the start of October. “The overhaul of the Companies Act has been a mammoth task but now the final changes are set to take effect. But of course, with so many changes to implement, Companies House is expected to be extremely busy over the next few weeks. Amanda said the Companies Act 2006 had been phased in over the last two years, with several rafts of changes to be considered. “The latest batch of new legislation brings yet more changes – one of the key developments this time is that directors’ home addresses can be protected, and providing a service address on documents will now be sufficient. A new scheme has also been introduced to help companies prevent corporate identity fraud, where documents can be filed online and paper documents will be automatically rejected. Two intrepid employees from Martin-Kaye Solicitors took the plunge to raise vital funds for charity. 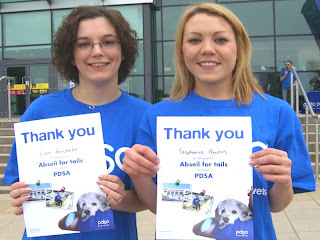 Lisa Batchelor and Stephanie Powers took part in an abseil down the House of Fraser building in Telford, in aid of the PDSA. And their efforts have proved a great success, raising over £300 to help raise funds for pets in need of vets. Local businesses have been keen to take advantage of the first in our new series of advice seminars. We have launched a new season of our popular HR and Employment Law in Practice (HELP) forums, and the first event was a great success. Hosted by our Alpha HR Team, the forum took place at The Prostar Stadium, in Shrewsbury, and tackled the hottest topics in Employment Law. Topics at the latest Alpha HELP forum included: the changes likely to follow the Government’s Equality Bill which aims to harmonise existing discrimination legislation; working time regulations; new rights for agency workers; pregnancy and maternity rights; calculating compensation; liability for workplace stress; and termination payments and compromise agreements. The forums run from 8am to 10am, usually quarterly, and provide employers and HR professionals with an opportunity to exchange ideas and to discuss trends. At each event, delegates receive a presentation dealing with the latest employment issues, together with practical examples, followed by a question and answer session, and the chance of a free contract audit. To find out more about future events or a free contract audit call 01952 272222 or visit www.martinkaye.co.uk and click on the Alpha logo.